One day a boy named Peter was at a party. He won a turtle. He has a little brother named fudge. Fudge is really naughty. For example, when Peter is trying to do his homework Fudge starts to bang pots and pans. Peter gets mad and he wishes he was never born. Fudge also gets all the attention. One day Peter gets home and sees that his turtle is MISSING. Was it Fudge? Read the book to find out! I like this book because it is funny book and something that can actually happen. Also, my favorite part was when Peter gets a new dog and he names him Dribble, which was his turtle’s name. Everything turns out happy. I would recommend this book to people who like reading funny books and silly adventures. It is a whole lot of naughtiness. So if you’re that type of person, I recommend this book to you. Read and ENJOY. 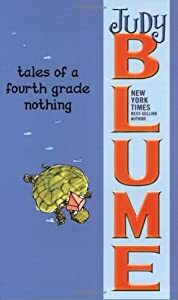 Judy Blume’s Tales of a 4th Grade Nothing is about when a boy named Peter has a weird brother named Fudge. Fudge is always making trouble and making Peter angry. When Fudge loses his two front teeth his mother blames it on Peter. Find out what happens next. Fudge is not believable because he ate a turtle and nobody can swallow a turtle. Peter is believable because many brothers have little brothers that they hate. My favorite part is when Fudge ate dribble, Peter’s turtle. My connection is that my big brother hates me like Peter hates Fudge. I would recommend this book to third and fourth graders. Third graders would like this book because it is easy to read and it is funny. I would give this book a ten out of ten rating. I like this book because it is funny and interesting. Do you have a weird brother? Peter does. Tales of a Fourth Grade Nothing is about when Peter wins a turtle. Then Peter’s brother Fudge ate one of his mom’s flowers. Next, the Yarbys come and Peter’s dad gets fired from their company. Finally, Fudge eats Peter’s turtle Dribble. Find out what happens to Fudge after eating Dribble? Most characters are not believable, but a few are. Peter is believable because he never did anything weird. Fudge is not realistic because no kid would swallow a flower. Their Dad is not that believable because no adult would pour cereal on top of their kid. Their mom is not believable because she doesn’t care about Peter and most mothers do care. I would rate Tales of a Fourth Grade Nothing a 10 out of 10 because every minute of it got better and better. I recommend this book to everybody who likes chapter books that are age 9-13. I also recommend this book to the kids who are the youngest in their family so they can live what Fudge lives. Tales of a Fourth Grade Nothing is a book you will never forget.